Our 1900 square foot indoor, climate controlled training facility allows us to hold classes year round. 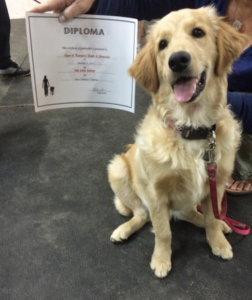 We currently offer obedience training for all stages of learning including: puppy training, basic obedience, competition obedience and agility classes. Not sure where to start? We are happy to help you and your pup get started. Dog training classes start every six weeks. Call us to sign your dog up for the next training session. Get them started right! This class will assist you in a happy and healthy start to family living. We will discuss aspects of your personal home environment and help you with any individual problems as they come up. Your questions and problems will also help others in the group as they learn to live with their new pets. We will work with the basics: Sit, Stay, Come, Down, Off, Leave it and walking nicely on leash. Young brains are sponges, and these little pups just want to please. Basic obedience is what all dogs need. We work with the basics: Sit, Stay, Come, Down, Off, Leave it, and walking nicely on a leash. But, we up the anti with focus and attention. These elements are what turn a good dog into a great dog, while working with each of the 7 basic skills. Learn tips for consistency, and step by step guides for getting it right with your dog. From Novice through Open to Utility and OTCH. We train with both AKC and UKC tests. Our trainer studies with Joanne Fleming out of Canada and is here to share those marvelous techniques to add to your successful journey. For more information on competition obedience, please feel free to leave a message for our trainer to call you back. We would love to help you achieve your title goals. Agility classes are a great way to let your dogs natural instincts shine. This is a strenuous activity, but it is great exercise mentally and physically for your pet. And, You too! It is important to prevent injury by training your dog the correct way to enter and exit an element. Agility has many levels from basics to weaves and jumpers. You will learn the correct way to do weave poles, Dogwalk, Jumps, Holds, Tunnel, Tire, Jumps and the Teeter. These classes will be held outdoors on our newly completed Agility Field. Private dog training lessons can be done at home or at the training facility. This is a one on one session with our trainer. We can work with all manor of issues and will help where needed. It is great for speeding up your training process and to fine tune your competition dogs. Also available, In-Home Puppy Training starting 9-11 weeks of age. Call for details. 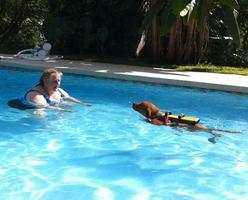 A special needs dog trains with owner, Christine.